FAQ: I want a remote control system that will control my shades AND some lighting. Will your radio equipped motors do this? Our radio equipped motors use RF (Radio Frequency) for controlling blind and shade motors (as seen on the right). The remote controls for these units work with the radio equipped motors and also control other things such as room lighting and yard irrigation. Our RF remote controls have several advantages over other systems: low cost, simple to use, long distance range, and the ability to control other devices. 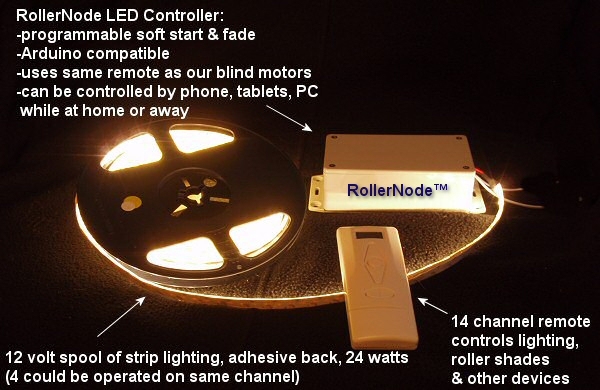 We now have an Arduino compatible LED companion controller for our radio equipped motors (RollerNode™). An RF (Radio Frequency) signal is used for transmission of the remote control signal. A small antenna in the motor (and the LED controller) receives the control signal and a microprocessor then uses the decoded signals to activate the motor (and LED lighting). The RF signal is also capable of passing through walls and in many cases can reach anywhere inside a typical home. 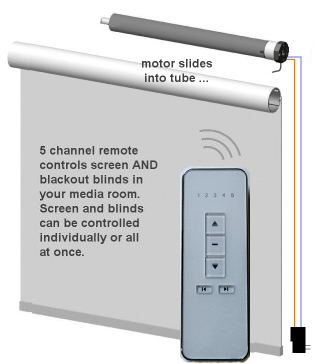 Our multi-channel remotes have up to 14 channels that can be programmed to control blind motors and other devices. If you extend your system with Vera™ the possibilities are unlimited. We have heard many complaints about isolated, proprietary control technologies, and we too have had the experience of using 6 different remotes in our living room. The RollerTrol system has been designed from the ground up to eliminate this problem of multiple, disconnected control systems. The ability to interface our motors with the Vera™ web server (or any device with a USB port) takes you one giant step forward to having a single, unified control system for all your devices. Available now, with our new Arduino compatible RollerNode™ LED lighting controller you'll be able to control LED lighting in various different rooms and hallways throughout the home, with the same remote that controls our radio motors. If you decide to use our Vera™ control system, you can extend your system to work with phones, tablets, PC or any other web enabled device, whether at home or away (and continue using your original hand held remotes in your home). The Vera™ system also supports Z-Wave™, Insteon™, x10™ and other control protocols.